There are numerous advantages to meditation. Recent scientific studies have shown that those who meditate regularly are calm, under control and deal with life better. Meditation may also offers many health benefits such as low stress and lower risk of heart disease. 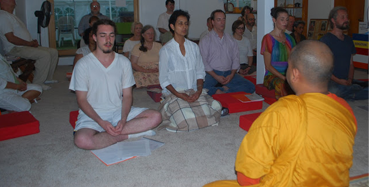 One of the best services that we offer are weekly meditation sessions. Meditation sessions are offered every Wednesday from 7 – 8:30 PM. Services are free and we welcome you to participate in these weekly sessions. If you are a beginner for meditation, we encourage you to come half an hour earlier and receive private instructions from monks. Meditation sessions are offered every Wednesday from 7pm – 8:30 PM. Services are free and open to the public. We welcome you to participate in these weekly sessions. If you are a beginner for meditation, we encourage you to come half an hour earlier and receive private instructions from monks. Please visithttps://new.livestream.com/accounts/10695460 for remote meditation participation and to view past events. You can Ask Bhante questions about Buddhist philosophy, teachings and general instruction.